Insulin Shock: What Are the Symptoms and Treatment of Diabetic Shock? Home » General Health » Insulin Shock: What Are the Symptoms and Treatment of Diabetic Shock? If you are diabetic, or have a loved one with diabetes, then you know how critical it is to monitor the body’s blood sugar level. When the level dips too low, there is a risk for insulin shock, also referred to as diabetic shock. At this stage, the person may fall into a diabetic coma, develop brain damage, or face an insulin shock death. Continue reading to learn the symptoms and what you can do if faced with insulin shock. To begin, our body converts carbohydrates into glucose, a sugar found in our blood. It is the foundation of our body’s energy, and we are able to use glucose as energy with the help of a hormone known as insulin. The pancreas produces and releases insulin into the bloodstream to balance the glucose levels when they begin to rise. This can happen after a meal. Insulin shock occurs when there is a lack of glucose to use as energy and too much insulin in your blood. Your body begins to stop functioning, as though it is starving. This can even happen with close monitoring as several factors can lead to insulin shock. Now that we understand how easily insulin shock can happen, let’s learn what symptoms and signs to look for. When diabetic shock occurs, it is vital that the person get immediate medical attention. A combination of some of these symptoms may give the impression that the sufferer is drunk. As with most diseases and disorders, time waits for no one; insulin shock offers additional symptoms when occurring at night. When treating insulin shock, it is imperative to call for emergency personnel right away. If the person is conscious, try to have them eat a sugar-filled snack with high protein such as nuts. Sometimes, a conscious person will not be able to eat and should be given a pure sugar product. If the person is unconscious, you can give a glucagon injection from a prescribed pen they may have on their person. If there is no glucagon, rub some sugar on the gums in their mouth or under their tongue. Do not try to put food in an unconscious person’s mouth. Emergency personnel will take over once on scene by giving the patient glucagon and CPR, if needed. Once at the hospital, the patient may be given 25 to 50 milliliters of 50% glucose solution intravenously over a short time span. Within 15 minutes, the patient should be more alert and able to ingest sugar products. Cardiac arrest may also occur as a result of the diabetic shock. In some cases, the patient may not react to treatment and slip into a coma. As the organs begin to stop functioning, brain damage is imminent as the brain is the first organ to shut down from lack of nutrients and glucose. A certified dietitian will help you plan your meals and snacks based on your lifestyle and dietary needs. Follow a healthy diet plan that outlines what time of day to eat specific foods to regulate the body’s insulin and glucose levels. Do not skip meals or snacks. Regularly check your blood glucose level. It is important to remember to check before and after any physical activity. Always keep these sugar pills or hard candy with you when you physically feel your blood sugar level drop. Keep snacks with you when you travel away from your home, including car trips, visits to the gym, and vacations. Talk to your doctor about your alcohol habits to understand your limits with insulin. Learn everything you can about insulin and your blood sugar levels. There is never a silly question when it comes to your health. Teach your family and friends about your condition, symptoms to watch for, and what to do in case of an emergency. Insulin shock is a possible reality for millions of people every day. It is a serious health risk for people with diabetes and, if untreated, can lead to life-threatening conditions including death. It is important for patients and their close family and friends to understand the signs and symptoms that can lead to diabetic shock. If caught in time, it can be stopped and the patient can recover with no serious complications. Support those at risk by taking steps to prevent insulin shock. Story, C., “Insulin Shock: Warning Signs and Treatment Options,” Healthline, March 2, 2017; http://www.healthline.com/health/diabetes/insulin-shock#Overview1, last accessed March 31, 2017. “What is Insulin Shock: Causes, Symptoms, Treatment, Prevention, Complications,” ePain Assist; https://www.epainassist.com/shock/what-is-insulin-shock, last accessed March 31, 2017. 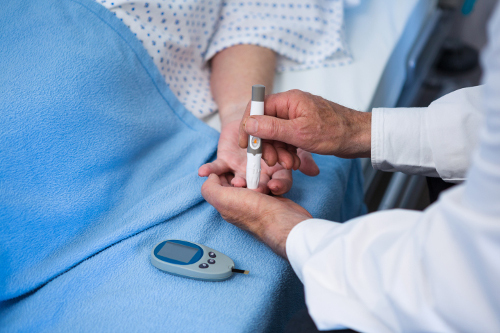 “What is Insulin Shock And What Causes It To Occur? Treatment,” Tandurust, August 29, 2016; http://www.tandurust.com/diabetes/insulin-shock-causes-treatment.html, last accessed March 31, 2017.